Transformation is consciously implemented changes that create new conditions and opportunities for the company’s development. These are manageable and meaningful rational changes. This interpretation of changes is of great importance in practical activities. It helps to correctly identify management priorities and successfully implement them. Transformation is not a one-time act. Transformation is a way of influencing and growing the organizational potential of a company. However, it should be noted that operation under conditions of constant conversion is impossible, because there is a situation of uncertainty and instability. All determine the type and nature of the transformation, the organization of their conduct, the comprehension of their necessity. The main feature of the transformation is its special significance and positive results. The typology of transformations contributes to the improvement of management, the process of adopting innovative projects and managerial decisions. To implement the transformation, it is necessary to select the appropriate time, in addition, there must be a willingness for their acceptance. This is a significant management problem. Even the most positive, but untimely transformation can bring negative results. When there is a need for transformations, it is necessary to carry them out, otherwise negative changes may occur, or, at best, stagnation (which is also a negative result). If you do not carry out the transformation, when there is demand for them, there is always a negative result. It is at this time that it is necessary to adjust the goals and update the priorities. Ultimately, the transformation reveals the creativity and ability of the staff. New requirements entail the need to form new approaches (see Figure 1). Transformation, if it is not false and is not oriented toward wrong goals, always means moving forward. Each transformation reflects the formation and implementation of priorities. Priority is the choice and preference of goals and managerial decisions, attitudes towards management and methods of its implementation, the type and form of organization. Therefore, in reality, the idea of ​​transformation should be linked to education, which accompanies the development of the company and, in turn, open the way to new transformations for it. This is a continuous cycle of development. As a rule, the transformation proceeds not isolated, but in a certain system, which combines various types of transformations. This is in a certain combination with innovative, strategic, creative management, project management and crisis management. The system of transformations is based on the combination of different types of management and gives a synergistic effect of the company’s development, which is rather difficult, but it is a great achievement. This is much more than just a systematic approach. Synergistic transformation means a special degree of development and management of the company. Typology makes it possible to effectively select management models, taking into account their capabilities, specific conditions, needs and goals. The transformation has many characteristics, for which it is possible to select certain types. Typology can be built according to different criteria. The more typological schemes will be considered, the better; This will increase the range of analysis and design of conversion systems (see Figure 2). Consider types of transformations in the light of double characteristics that reflect the objective unity of their contradictions. The scheme created by us is identical to the typology of the transformations, because The notion of «change» does not contradict the notion of «transformation», the former is an integral part of the second. There is a transformation both in the development of the company and its functioning. The first reflects the need to support certain proportions and ratios in the company, the second — the appearance of quality, which makes the company more perfect, stable and viable. There is a real need for this or that transformation, but simultaneously it is possible to dominate one over another. For example, in the sphere of resource use, taking into account actual needs, choosing strategic development, etc. Transformations can be carried out both inside the company, and taking into account external changes. If within the company there is a process of «boiling», the transformation can’t become successful. Transformations also differ by results. Some may have a predictable result, the results of others may be unpredictable, in other words, they may have a high degree of probability. In practice, this occurs quite often, which is due to the high complexity of the problem, insufficient information, resources and time, imperfect processing of development trends, errors and inaccuracies in the development of transformations. 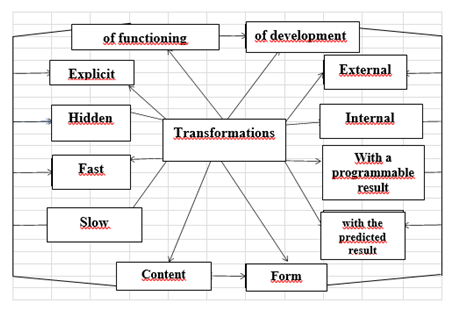 Transformations can be clear or foggy, although it is clear that a successful result is possible only with specific and understandable changes to the staff (see Figure 3). On the prospects of implementation and implementation, the transformations are fast and slow, but it is important that they do not flow lethargically and do not last forever. The study, assessment and perception of the problem can occur in different ways, therefore, when making a decision, the professionalism and experience of the manager, the qualifications of his assistants and the entire staff are important. Thus, transformation is a collective product. Thus, the art of transformation is an important factor in both design and implementation in practice. For successful changes, a deep understanding of the problems existing in the company, proper analysis and evaluation of their features and interrelations is necessary. In conclusion, it can be said that the art of transformation contains many related organizational issues, such as the redistribution of rights and responsibilities in terms of professionalism and capabilities, staff motivation, and resource support that includes questions of strategic and tactical management and development of the company. Becker Gary S.,Human Capital. — N.Y.: Columbia University Press, 1964. Background. The transformation is not any change, but only their totality. 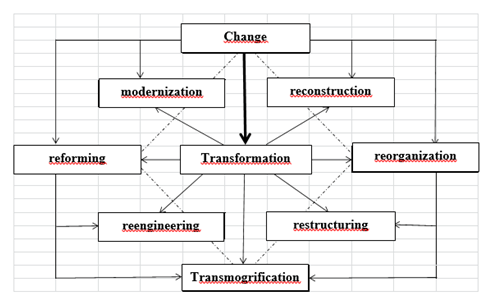 The article considers the types and typology of transformations that are onducted in the company in order to achieve positive changes in its activities and obtain a synergistic result. Methods. We used the method of statistical analysis, synthesis, comparison and classification. Results: Transformation is consciously implemented changes that create new conditions and opportunities for the company's development. These are manageable and meaningful rational changes. This interpretation of changes is of great importance in practical activities. It helps to correctly identify management priorities and successfully implement them. Conclusions. It can be said that the art of transformation contains many related organizational issues, such as the redistribution of rights and responsibilities in terms of professionalism and capabilities, staff motivation, and resource support that includes questions of strategic and tactical management and development of the company.